Santa has a new name . . Santa William Joseph Clause! Doesn’t that have a great ring to it??? It all started Christmas morning. A.J., Cameron and I were pretty anxious to open gifts. Presents were all around the tree . . teasing us. We started opening and A.J. took one that was fairly large. When he opened it, it turned out to be a William Joseph Coastal fishing pack. It was the BEST! We had both been eyeing the William Joseph packs all year. 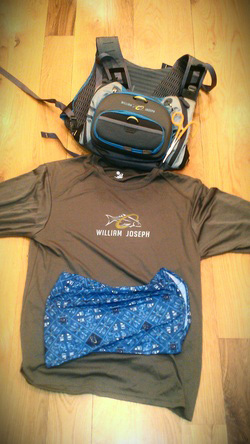 I then opened a present and it was a confluence fishing pack also made by William Joseph. WOW! Then we both got two presents that our mom said we needed to open at the same time. We hadn’t had to do this since we were baby, little twins . . .LOL. What could they be???? It didn’t take long to find out! Bows flew, paper ripped and the boxes gently were opened. . . . NOT . . . inside we found a William Joseph shirt, a sun mask, sticker and a catalog. But even better . . . my dad told us this was a gift directly from William Joseph letting us know that we were going to be sponsored by them. HOLY COW! William Joseph is going to sponsor TWIN TERRITORY! We are so excited. They make the best fishing and hunting stuff! We will do our best to make you proud William Joseph by making ourselves a name while wearing yours! Thanks so much Santa William Joseph Clause! Hope your Christmas was as good as you made ours.